The doctors were all about getting freaky on Grey's Anatomy Season 11 Episode 12. Or not getting freaky, to be more accurate. While Maggie played babysitter, she received numerous calls from Derek wondering about Meredith's whereabouts. So, of course, Maggie confronted Meredith, who dodged her questions about visiting D.C. I wasn't surprised Maggie got upset about having to lie for Meredith. Then again, I also partly understood why Meredith didn't want to come clean to her newfound sister. In the end, I was glad Meredith did eventually tell Maggie the truth. Meredith and her packed luggage ended up at a hotel nearby the airport. She initially made it to the airport and even through security, but she just couldn't make it on the plane. I like the way Meredith and Maggie's relationship is slowly progressing. I was also really glad that Meredith ended up at Alex's because she wanted to talk about what happened. Meredith admitted that she didn't want to leave Derek, but that she also just doesn't want to be with him right now. Although heartbreaking as a diehard MerDer fan, I get it. As much as I liked seeing Owen and Callie continue their talks about dating, a big part of me did not want to see them hook up. Luckily, that did not happen and it was because Owen and Amelia might actually be a thing. Did you see that coming? I sure didn't. I'm not sure what I think about Owen and Amelia together just yet, but I've always loved Amelia and have rooted for her since Private Practice. With a sweet and quick kiss, is it too soon to root for these two? 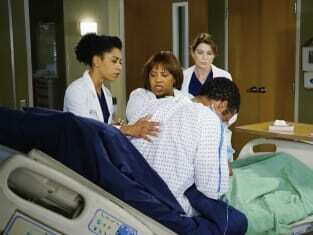 Meanwhile, Bailey and Ben became concerned about Ben's brother after he was admitted to the hospital. Much to Ben's dismay, his brother was in the process of transitioning into a female. Ben's brother was tired of pretending to be someone he wasn't. Ben couldn't find a way to understand and was utterly upset and felt like his brother had lied to him their entire lives. Hey Ben, like your wife said, it's not about you. Bailey found a way to comfort Ben's brother and arranged for a consult with Jackson. I seriously hope Ben comes around because family is irreplaceable. Elsewhere, a patient showed up at the hospital unconscious after falling down a set of stairs. Come to find out, the patient was pretending to faint just so that her clingy and obnoxious boyfriend would stop talking. I didn't care too much for this storyline and thought it was silly that Callie had to break up with the boyfriend for the patient. I also didn't like how Catherine was using Richard. It's understandable that Catherine was having difficulty keeping her distance from Jackson and April, but with the exception of last week, I haven't cared too much for her. Dr. Herman really shined throughout this installment as she stole the couch in the attending's room, flirted with Owen, and even teased Arizona. I really hope that Amelia can save Dr. Herman because she's finally becoming likeable. I couldn't help but wish Meredith went to visit Cristina when she confessed the truth about her whereabouts to Maggie. Meredith took three days off from being a doctor, mother, and wife. There's nothing quite like me time. I know I could use some. How about you? I loved when Alex said he's going to marry Jo. I can't wait until that happens. More Jolex moments, please! There sure was a lot of talk about Jo and her disdain for pants. I am in total agreement with her and believe pants simply aren't necessary at home. What should we call Amelia and Owen? Omelia?! Leave your ideas in the comments. Overall, I thought "The Great Pretender" was fair. Nothing major happened, and I'm ready to see more with Dr. Herman's case. Hit the comments to share your thoughts. Don't forget you can watch Grey's Anatomy online via TV Fanatic! NOTE: Grey's Anatomy Season 11 Episode 13 will be titled "Staring at the End" and air on Thursday, February 26. 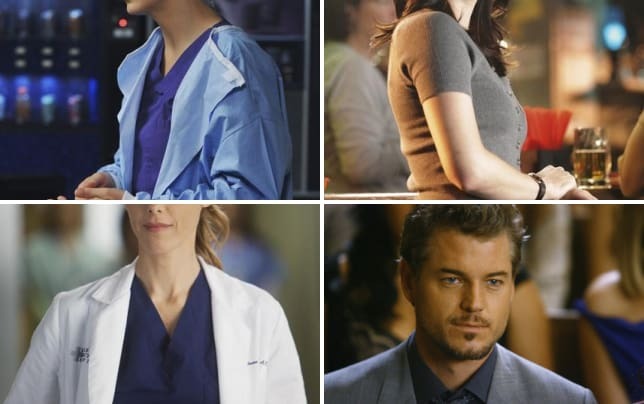 Grey's Anatomy Cast Members: Where Are They Now? It's her song. So, get off the stage and let her sing it. Permalink: It's her song. So, get off the stage and let her sing it. 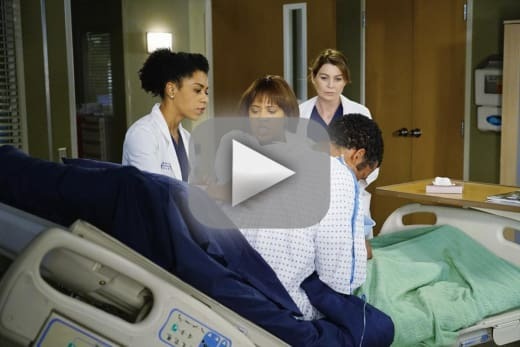 Grey's Anatomy Round Table: Omelia?!? Amen!